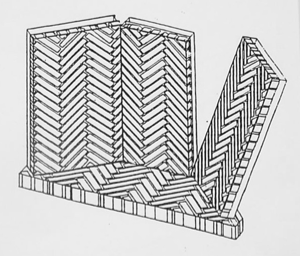 Herringbone fireplace fireboxes built by Superior Clay Corporation are faced with 9″ x 1.25″ firebrick in a vertical Herringbone pattern. The fireboxes are shipped in three sections – two covings and the fireback (inner hearths are also available) and are easily erected at the job site. The pre-made fireboxes save master masons much time and aggravation and allow less experienced masons to build beautiful Herringbone fireboxes. 1. The mason lays the inner hearth, level and centered, in a bed of mortar. 2. The next day, the covings and the fireback are set in place, in the refractory mortar provided, on the hearth. They are temporarily supported with concrete blocks or lumber. 3. A solid masonry-backing wall at least four inches thick is built to permanently support the firebox. 4. 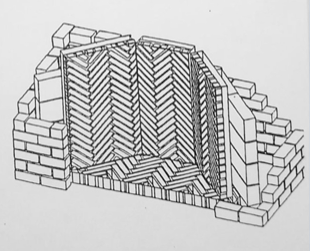 Refractory mortar is used to fill any cracks between the four pieces of the firebox and the firebox is washed with clean water. 5. Now the firebox is ready to be treated like any other – carefully – until the solid masonry has cured.